Whitney Houston's self titled album was certified Diamond by the RIAA, with sales exceeding 10 million copies. The music industry suffered another loss in their family this past week. Recording artist Whitney Houston was found dead in her suite at the Beverly Hills Hilton Hotel, merely a few hours before she was supposed to attend Clive Davis’ pre-Grammy celebration. While people anxiously wait to hear the cause of death, Whitney’s family, friends and fans celebrate the gift she has left behind; her music. A strong foundation paves the way for great success. And this is exactly what Houston did. Whitney was born to John and Cissy Houston on Aug. 9, 1963. Whitney’s mother was a reputable artist that sang back-up for artists such as Elvis and Aretha Franklin. Franklin would later become Whitney’s godmother and also, a close friend throughout Whitney’s life. Whitney grew up surrounded by music but at home, gospel music was the heart of her singing. Unlike most teenagers, Whitney often spent time traveling from nightclub to nightclub where her mother performed. At only 15, Whitney was singing background vocals for artists like Chaka Khan, Jermaine Jackson and Lou Rawls. She dabbled with fashion modeling in the early 80s after being pointed out by a photographer. Whitney was featured in magazines such as Seventeen, Glamour, Cosmopolitan and Young Miss. Fortunately, music was still her main focus and in 1982, Gerry Griffith, director A&R at Arista Records, was the person to find Whitney. He watched her perform with her mother and convinced Davis to come see her. After witnessing her magnificent voice himself, Davis signed Whitney to Arista Records with a worldwide recording contract. Whitney’s self-titled debut album was handled almost perfectly by Arista Records. Davis knew that Whitney was going to be outstanding. He postponed working on the album immediately after signing because they wanted it to be flawless. Davis wanted to start Whitney off from scratch. Her voice, which was so new and powerful, couldn’t be wasted on covering other people’s music. Searching for the best writers and producers to help create Whitney’s debut album was deemed to be hard but in the end, a team was built and recording commenced. A track originally offered to Roberta Flack, “You Give Good Love” is the opening track on this album and was also released as the lead single. This song is considered by many as one of Whitney’s best hits of the 80s. “You Give Good Love” is proof that Whitney was able to combine bits of soul music into her ballads so that it could appeal to multiple audiences. Along with “You Give Good Love,” “Saving All My Love For You,” “How Will I Know” and “The Greatest Love of All” were four of the ten tracks to become number one hits. These songs were considered to be the outline for future divas to come. 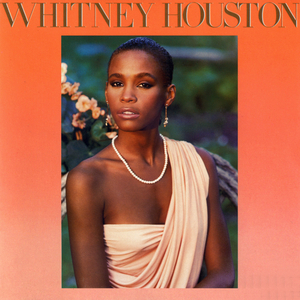 Brighter tracks such as “Thinking About You” give Whitney Houston a well-rounded feel and proves that Whitney accomplished crossing over to the pop charts. Musical stardom solely based on vocals was not something you came across easily; Whitney created a legacy with her incredible solo debut. The album was an overall success on the charts. Whitney Houston remained on the Billboard 200 for 162 weeks, with 46 weeks in the top 10. Rolling Stone named it the Best Album of 1986 and was the best-selling album of 1986 in the United States. She would win her first of six Grammy Awards at the 1986 Grammy Awards for Best Pop Vocal Performance.